Creating a network of 600 local leaders in 84 villages in the Buffer area of Tadoba Andhari Tiger Reserve and its forested corridors with the skills and knowledge to resolve human – tiger / leopard conflict in the region and to create an Early Warning system to minimise threats of attack. 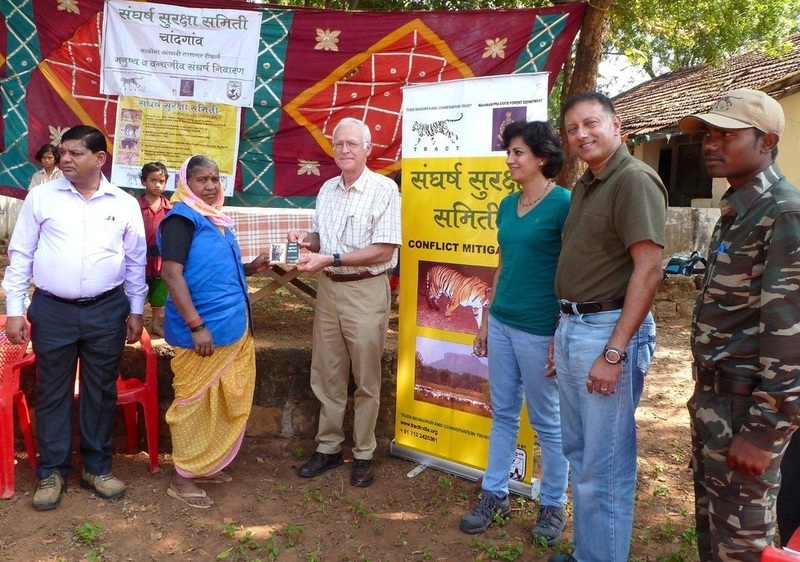 TRACT has been working towards understanding reasons for human - tiger / leopard conflict in human dominated forest fringes and to find mitigating measures for the same. Study of the high conflict between people and large carnivores 'Large Carnivore Attacks on Humans in Central India: A Case Study from the Tadoba Andhari Tiger Reserve' by Dhanwatey et al. 2013, states that conflict mostly happened in forest areas while victims were in a crouching position collecting firewood or other forest produce, or were attending to natures call squatting near the bush. 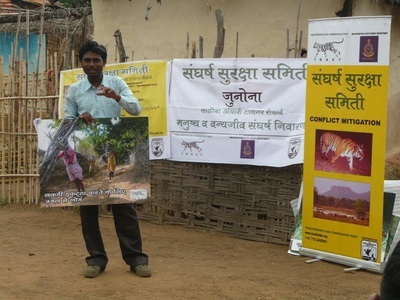 Primarily, under the Corridor Conservation Program (2008-2011) supported by the National Tiger Conservation Authority for mitigating of human - large carnivore conflict, TRACT in collaboration with the Maharashtra State Forest Department has trained more than 400 forest field personnel working in the forest fringes and forested corridors of Chandrapur Circle, where conflict between humans and large carnivores has been alarmingly high. 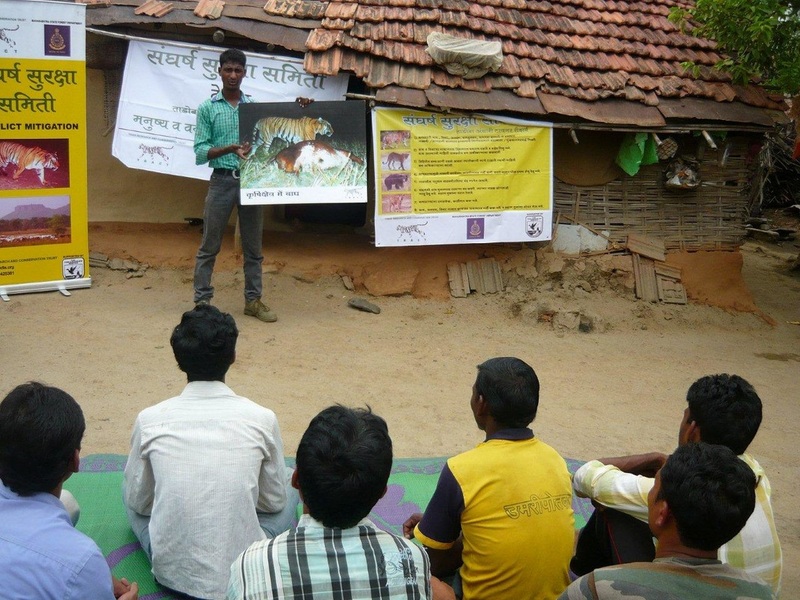 Workshops for understanding reasons for conflict, monitoring of large carnivores, handling of Camera traps and GPS units, identifying threats to tigers and leopards in forest fringes and forested corridors were conducted by TRACT followed by recommendations for mitigation. 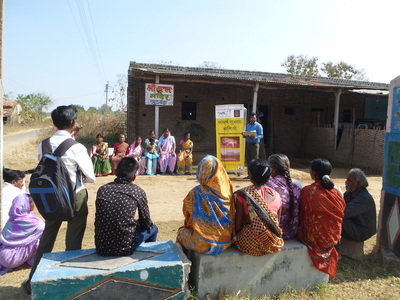 In continuation with efforts to mitigate this conflict TRACT is also working with the local communities since 2013 through a program supported by the U.S Fish and Wildlife Services, to reduce attacks on them by creating awareness through Education and creating local leaders in these communities to take this awareness forward. Primary Response Teams of 7 men and women in 84 villages in the buffer and forested corridors of Tadoba Andhari Tiger Reserve, Chandrapur district have been selected for their motivation and keenness to work towards reducing their vulnerability to attacks by tigers, leopards and sloth bears. Empowered with information about reasons for conflict and their role in reducing their vulnerability to attacks, these local leaders have learnt about the code of conduct for individuals and norms for villages that will reduce circumstances which lure large carnivores closer to their precincts. 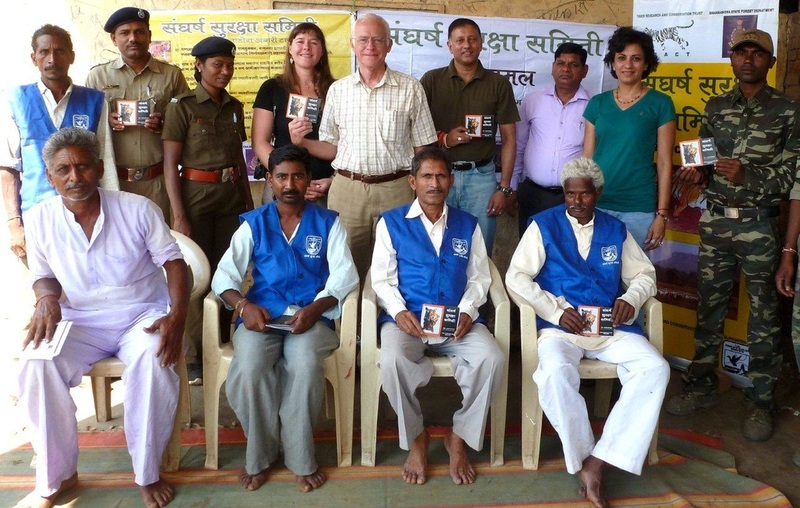 This program has also created a platform for dialogue between these primary response team members (local leaders) and the local forest guard to share information about presence of tigers, leopards or sloth bear near villages and fields, thereby extending this information to the community to make them alert to the threat of conflict if they venture into the forest. This Early Warning System has helped in people knowing about presence and avoiding these thickets. TRACT staff have on many occasions helped children to get home safely. 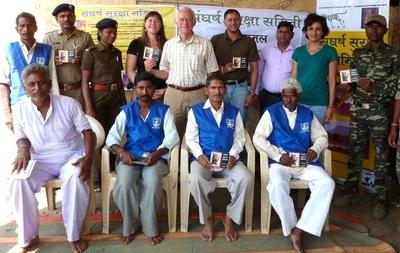 We have also created a First Line of Defence in these leaders by bringing them on the same page as the local forest guard through educative workshops about their behaviour and that of their community during a conflict situation, to ensure that they work as a team with the forest staff, mitigating with no harm to them or the wild animal in case of such an eventuality. TRACT has made a Manual in the local language for these leaders, with illustration that carries all information about the code of conduct for individual, circumstances that lure tigers and leopards closer to village precincts and how these should be avoided.